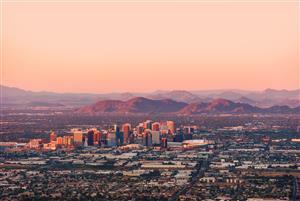 Placed about nine miles to the northwest of downtown Phoenix, Glendale is a part of Maricopa County, Arizona. Within this town, residents can find a number of historic sites like the Sahuaro Ranch and the Manistee Ranch. Each year, Glendale hosts events like the Glendale Folk & Heritage Festival, the Glendale Chocolate Festival and the Glendale Jazz & Blues Festival. To experience some of the culture of the area, residents can visit the the Deer Valley Rock Art Center, the Spotlight Youth Theatre or the Brelby Theatre Company. For a fun trip down memory lane, residents at Glendale property management rentals can visit the Cerrata Candy Co. factory tour. During the month of December, all of downtown Glendale lights up with Glendale Glitters' Christmas lights and decorations. Throughout the year, residents can enjoy a range of stores, restaurants and antique shops within downtown Glendale. The high proportion of antique shops has meant that Glendale is officially advertised as Arizona's Antique Capital. Meanwhile, nature tours can be found at the Elsie McCarthy Sensory Garden and the Adobe Mountain Desert Park. In the late 1800s, this land was once primarily desert. William John Murphy created a canal in 1885 that brought water to the barren desert. After the construction of a road that connected Phoenix to Glendale, the town began to grow. It was home to a temperance colony in the 1890s. In 1906, the construction of the Beet Sugar Factory led to Glendale's rapid growth. Since then, the city has continued to grow in size and diversity. Today, it is home to Arizona State University's Thunderbird School of Global Management, Glendale Community College and Midwestern University. For excellent seafood dishes, residents should visit the Pappadeaux Seafood Kitchen. American steakhouses are abundant in the area. Residents can dine at restaurants like Fleming's Prime Steakhouse and the Arrowhead Grill. For top Italian cuisine, make sure to check out Fire Pie and Bottega Pizzeria Ristorante. Meanwhile, excellent Mexican and Southwestern cuisine can be discovered at Bobby Q, Los Reyes De La Torta and Fuego Bistro.